MailStore is a tool with the functions needed to create backups of emails from your mail client. A tool that will help you avoid any collateral damage you can cause loss of data. It supports the full range of mail clients from Microsoft and Mozilla: Outlook, Outlook Express, Windows Mail, Exchange accounts, Thunderbird, SeaMonkey and email accounts POP3 or IMAP. Version 12.0.0.14279 is a freeware program which does not have restrictions and it's free so it doesn't cost anything. 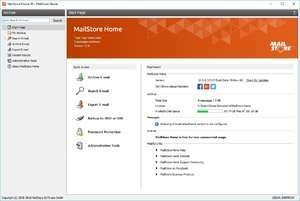 For security reasons, you should also check out the MailStore Home download at LO4D.com which includes virus and malware tests. Additional screenshots of this application download may be available, too. MailStore Home download been highly rated by our users.